As the name implies, job safety analysis (JSA) is a process that is used to help review specific jobs or tasks to help identify safety hazards, and implement accepted best practices to make improvements. In some work environments, this process is called a job hazard analysis, or a job hazard breakdown, but the most commonly used term is job safety analysis, or JSA. A JSA is to be performed on a particular task, not necessarily a department or facility. The more specific the task that is being analyzed, the better. For example, doing a job safety analysis on 'baking a cake' wouldn't be very good, but instead it would be better to do one on 'mixing ingredients,' 'putting cake in oven,' and 'cutting the cake' This is just a simplified example, but illustrates how to identify what types of jobs or tasks should be looked at. Many companies perform job safety analysis on tasks within their facility with the simple goal of improving safety in the workplace. 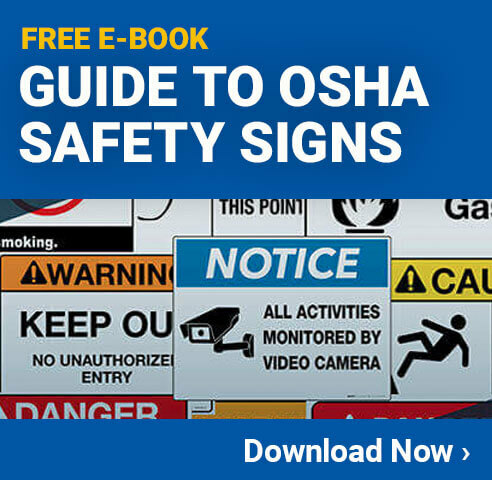 In many types of industries, however, performing a JSA is actually a requirement from OSHA. In the oil and gas industry, for example, OSHA has a series of processes that must be completed in order to ensure the jobs are completed safely. Performing a JSA often involves a step by step process that looks at each task, identifies the potential hazards, proposes controls to reduce or eliminate the hazards, and then checks again. This is all done to not only keep employees safer, but also keep the facility running smoothly with less downtime related to accidents or injuries. The following image gives a nice high level overview of what a job hazard analysis is, and how it is done. It is an excellent introduction to this concept. When learning to do a job safety analysis, it is important to understand some key concepts and ideas. The following categories should be learned about and understood by everyone involved with the JSA's in any facility. Hazards to Health - Hazards to health are anything that can cause a health-related issue, including risks that can build up over time such as exposure to certain chemicals. Hazards to Safety - Hazards to safety are anything that is more likely to cause any type of injury to those in the area. Physical Object Hazard - Any physical object that can cause a safety or health issue if it is touched or inhaled. This would include things like hot surfaces, certain exhaust gasses, and more. Hazardous Work Type - This is a group that requires a specific permit or qualification in order for someone to perform the work. For example, high-low operators have to have special training and licenses in order to conduct their job. Duty of Care Breaches - These are when there are legislative or company rules in place that restrict how or who can perform the tasks. This would include many things that are regulated by OSHA. Hazard families break down specific hazards into different groupings so that they are easier to identify. This can also help to find the right controls for a particular hazard based on what is working for other hazards in the same family. There are many different hazard families, and the following are some of the more popular examples. Physical, electrical, hydraulic, biological, thermal, environmental, psychological, developing, mechanical, pneumatic, magnetic, and gravitational. Clearly Identifiable - This is used when a hazard is very clearly linked to a specific task or part of a task. Possible - If a hazard can possibly occur when a particular job is performed, this is the term that is used. These terms can be used with or without additional descriptions to make them more precise. Some hazards are imminently possible, very possible, or somewhat possible, for example. This type of extra description is not always used, and there aren't any specific standards that are used for this type of thing. Each facility will need to use the terms that they come up with, and make sure that everyone is aware of their precise meanings. The mechanism of an injury is used to describe how the injury actually took place. This category covers a lot of information, but when used correctly it can help to provide precise information about a hazard that has already occurred, or a predictable incident that could occur. There are a variety of other mechanisms of injury that can be used depending on the environment in question. All of these different terms and categories can be used together to provide an excellent description of everything from the hazards that are present to a description of what type of risk there is. Fuel a Lawn Mower - Look at potential hazards, which include spilling fuel, fuel coming in contact with skin, fuel coming in contact with hot engine and potentially igniting. Controls that can be put in place include using proper fueling funnel, taking care not to overfill the tank, wearing gloves, and never filling a hot engine. Using a Machine Press - Potential hazards include having someone put their hand or arm into the press, or having an object shot out of the press when engaged. Controls that can be put in place include a physical barrier to stop someone from putting their hand in the machine, sensors that detect the presence of unexpected objects, and wearing proper personal protection Equpment if necessary. Performing Maintenance on Machine - Risks here include the machine unexpectedly engaging, electrical shock, and others that are determined based on the specific machine. To mitigate the risk, facilities should use the lockout/tagout process, and always entirely remove all power sources from machines before performing any work on them. Erecting Scaffolding - Whenever putting up scaffolding there is the risk of essential components failing, and the normal risks of working at heights. A good control to put in place would include adding a barricade to prevent unauthorized access. Another effective option is to have a process in place to verify the quality of each component before it is used in the scaffolding. Welding Objects - Welding has hazards associated with electrical currents, fumes, heat, and more. In this case, most of the hazards can't be entirely eliminated, or even necessarily mitigated. Instead, using personal protection equipment can serve as an effective control. Quality PPE offers a significant amount of protection for the welding operator. Implementing policies to ensure those who aren't actually welding stay out of the area can also help to keep everyone safer. When done properly, a job safety analysis will identify potential hazards, and propose potential ways to eliminate them. The hazards are often eliminated by using controls that can prevent the unwanted risk from taking place. Whenever a risk associated with a job is found, it can be very effective to run through the hierarchy of controls and propose solutions from each category. Some of the solutions may not be realistic or possible for a valid reason, but the simple act of working toward identifying different controls will help ensure everyone involved has all the options possible for mitigating risks within the workplace. 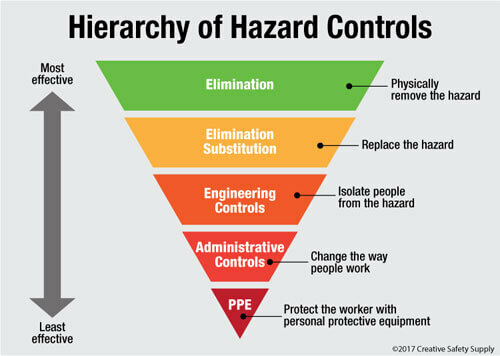 The following image gives a breakdown of the hierarchy of controls that can be used to help eliminate hazards in any task. When used properly, this hierarchy of controls is a very effective way to eliminate and mitigate almost any type of hazard. When working to mitigate hazards in the workplace, it is best to start from the top and work down as needed. Whenever possible, entirely removing the hazard from the equation is ideal. At the bottom is personal protection equipment, which is essentially going to offer protection to the employees should the hazard occur.